THE treatment of vulnerable inmates at Hydebank Wood has been repeatedly criticised by prison inspectors and now new figures obtained by The Detail reveal how inmates at the young offenders centre are seven times more likely to be punished with solitary confinement than inmates at Maghaberry. The Independent Monitoring Board (IMB) prison’s watchdog has repeatedly called for the use of solitary confinement against young offenders at Hydebank to be significantly reduced to bring it into line with other young offender centres in the UK. However, figures obtained by The Detail reveal a huge surge in the use of solitary confinement against young prisoners at Hydebank since 2008 while in contrast its use as a punishment has been dramatically scaled back at Northern Ireland’s main adult prison at Maghaberry. •	220 cellular confinements, the equivalent of practically the entire prison population at Hydebank, have been imposed against inmates in last six months. •	A 300% rise in female prisoners sentenced to solitary at Hydebank between 2008 and 2011. •	A 130% rise in young male prisoners sentenced to solitary in Hydebank during same period. •	A 115% rise in number of Hydebank inmates sentenced to seven days or more in solitary in contrast to a 41% drop at Maghaberry. In an interview with The Detail Northern Ireland Prison Service (NIPS) director Sue McAllister maintains that solitary confinement is justified as a necessary part of the prison regime. However the father of one Hydebank inmate told The Detail that his son is being psychologically damaged and treated like a “caged animal” after being forced to spend months on end in solitary confinement. Meanwhile two independent experts have questioned whether there are any rehabilitative benefits to sentencing vulnerable inmates to extended periods in solitary confinement. In 2009 the IMB criticised the excessive use of cellular (solitary) confinement at Hydebank, which it said was indicative of a punitive regime operating within the jail. It found that, despite repeated criticism, the use of solitary confinement within Hydebank had risen by 63% year on year. Concern was expressed that many prisoners sentenced to solitary for more than seven days were suffering from mental illness and/or personality disorders and at times “the humane treatment of prisoners was of secondary importance” to the Hydebank regime. At that time the prison’s watchdog recommended that the use of solitary confinement against young offenders should be reduced from 7 days to a maximum of 3 days, to bring it into line with other young offender centres in the UK. Instead the prison service increased the maximum period of solitary confinement from 7 to 14 days at Hydebank. However figures obtained by the Detail under the Freedom of Information (FoI) act reveal that instead of reducing solitary confinement against young male prisoners there has in fact been a dramatic rise in its use at Hydebank. See breakdown of NIPS figures (table 1) , (table 2) and (table 3) in relation to cellular (solitary) confinement in Northern Ireland’s prisons . In 2011 Maghaberry had an average prison population of 1,000 inmates while an average 250 prisoners were held at Hydebank on the outskirts of south Belfast. Between January and December 2011 a total of 110 prisoners in Maghaberry were sentenced to solitary confinement on 183 different occasions. But, despite Hydebank being four times smaller, the figures show that 187 inmates in the south Belfast prison were punished by cellular confinement on 581 different occasions during the same 12 month period. An analysis of the statistics show that a prisoner in Maghaberry had an estimated 1 in 10 chance of being punished with solitary confinement. In stark contrast, the equivalent of three quarters of the prison population at Hydebank were sentenced to solitary confinement during the same 12 month period. The figures are even more startling when compared with the statistics 2008 when there was a total of 959 cellular confinements. At that time Maghaberry had 430 instances of cellular confinements in contrast to 251 at Hydebank. By 2011, when the total number of cellular confinements stood at 1041, the punishment figures in the two prisons had dramatically reversed, with the figures in Maghaberry plummeting from 430 to 183 while punishments in Hydebank had more than doubled from 251 to 581. The figures further show that solitary confinement of female prisoners in Hydebank rose by nearly 300% from seven in 2008 to 25 women being sentenced to solitary confinement in 2011. In the same four year period instances of young male prisoners sentenced to solitary in Hydebank rose by nearly 130% from 244 in 2008 to 556 in 2011. Between the same four year period the number of prisoners sentenced to more than 7 days punishment in Maghaberry dropped by 41% from 143 in 2008 to 85 in 2011. In contrast the number of Hydebank prisoners sentenced to 7 days or more rose by 115% from 41 in 2008 to 88 in 2011. However the nature of the offences for which prisoners are sentenced to solitary confinement has also raised cause for concern. In 2011 15 inmates at Maghaberry were punished with solitary for fights/wrestles yet in Hydebank that figure was more than 6 times higher with 94 prisoners punished for the same offence. 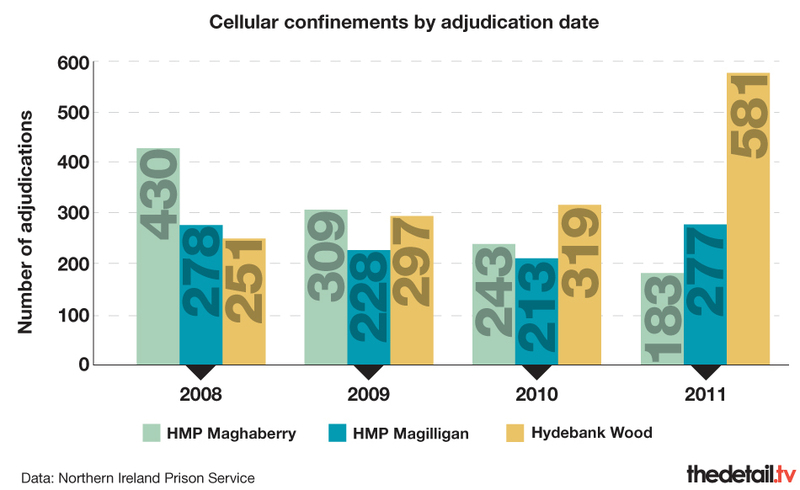 In 2010 30 prisoners in Maghaberry were sentenced to solitary confinement for using foul and abusive language but by 2011 that figure had dropped to 13. In contrast the number of prisoners at Hydebank convicted for the same offence more than doubled from 27 to 51. Alarming rates of solitary confinement at Hydebank has continued in the first six months of 2012. Figures, obtained by Sinn Fein MLA Daithi McKay, show that solitary confinement was used on 220 occasions against Hydebank inmates between January 01 and June 31 2012, the equivalent of practically the entire prison population being punished in this way. 216 of the punishments were against young male prisoners, with 32 occasions in which an inmate was sentenced to 7 days seven days or more in solitary. Prison service claims that the majority of cellular confinements at Hydebank are a result of physical assaults appear to be contradicted by NIPS’s own statistics. In total only 34 out of 220 offences were linked to assault or fight/wrestles while the majority of the other 186 offences related to possession of unauthorised articles; possession of drugs; damage to property ; refusing to give a sample; foul& abusive language; disobeying an order and endangering health & safety. EXPERT QUESTIONS WHAT FIGURES REALLY SAY ABOUT SOLITARY? Professor Phil Scraton is Chair of Queen’s University’s Institute of Criminology and Criminal Justice and has written extensively about the detrimental impact that solitary confinement has on vulnerable inmates. He does not believe that the dramatic rise in the use of solitary confinement against inmates at Hydebank is evidence of any change in prison policy. “I don’t think there’s a policy to put more people into solitary confinement. “I think that what happens is you develop a custom and practice. He says the dramatic decline in the use of solitary confinement at Maghaberry is clear evidence that prison governors have responded to concerns raised in a series of critical watchdog reports. However he questions why the same lessons do not appear to have been learned at Hydebank. “What we can see is on the other hand a serious issue that perhaps suggests that all is not well within Hydebank Wood. Prisoner Ombudsman Pauline McCabe has reported on a number of serious incidents at Hydebank, including the deaths of inmates Frances McKeown and Samuel Carson in May 2011. The Carson and McKeown families were both highly critical of the treatment of their loved-ones while prisoners at Hydebank. Ms McCabe insists that there needs to good order and discipline maintained at Hydebank but questions whether there is any benefit by sentencing vulnerable prisoners to extended periods in solitary confinement. “I have said many times I believe that locking people up is the enemy of the vulnerable,” she said.